Napalm Death has released many classic albums over its long career, and Utilitarian is easily on par with its very strongest work. Every couple of years, for the past quarter of a century, grindcore legend Napalm Death has released a new album and set out to smash the state. With its calls for social justice wrapped in a macerating blend of grind, death metal and discordant fury, the band has toured relentlessly – playing everywhere, from huge festival stages to sweaty clubs and squats. Never resting on its laurels or diluting its message, the band, birthed in Birmingham, England in 1981, has had to overcome numerous obstacles throughout its career. Inter-band tensions, a rough patch of albums in the '90s and the death of guitarist Jesse Pintado made for difficult times. But since the early ’00s, Napalm Death has been on a roll, releasing a series of widely celebrated albums. Napalm Death's late career reinvigoration has seen it produce some of its most visceral, incensed and blistering material. The group has always held a venerated position within the extreme metal fraternity, but its seemingly unstoppable zeal, and the escalating viciousness of the band's last three albums –The Code is Red … Long Live the Code, Smear Campaign and Time Waits for No Slave – has earned it increasing acclaim. While other bands are thinking about putting their feet up, Napalm Death is releasing some of the most ferocious albums of its existence. Utilitarian, the band's 14th album, finds it sounding as vital, driven and destructive as ever. There's no lack of inspiration in the contemporary global climate for a band long recognized as an astute social commentator. Chief lyricist and vocalist Mark 'Barney' Greenway delivers his views with abundant vigour, sounding as enraged as ever. But his lyrics are not mere polemics. Napalm Death has never said something is wrong without asking why. The prime reason the fanbase has remained so loyal is because the band poses erudite questions in such a musically eviscerating manner. Utilitarian finds Napalm Death in an incandescently angry mood. With Greenway spitting vitriolic venom, the band lets fly with an abrasive mix of quick-fire tunes. They’re laden with Mitch Harris' distinctively distorting riffs, Danny Herrera's express-train percussion, and Shane Embury's churning bass. The album pounds naysayers into the dust, and lurking in its seething grooves is the band's signature punk rock bite. Tracks like "Quarantined", "Errors in the Signals" and "Protection Racket" are quintessential Napalm Death – righteous detonations of unencumbered rage. Utilitarian is full of tracks exhibiting the band’s characteristic style. And while an album filled with confrontational gems like "Nom de Guerre" and "A Gag Reflex" would leave fans satisfied, the band has new and ingenious tricks to offer. "The Wolf I Feed" and "Blank Look About Face" finds Greenway defying preconceptions by actually singing. His guttural growls have always been a defining feature of Napalm Death, underscoring the band's rebelliousness, yet Greenway's cleaner tones do not dull the album’s edge. Quite the opposite: they add in some real transformative textures. The fact that Napalm Death has chosen at this stage of its career to present new ideas and craft new sounds illustrates an admirable desire to fight stagnation. It also reflects the band’s lyrical vision: to never surrender to expectations, and to never settle for middle-of-the-road ideas. It's not just the new vocal stylings that illustrate the band's desire to evolve. John Zorn turns up to provide a slice of fusion and atonality, with a frenzied saxophone solo on "Everyday Pox". 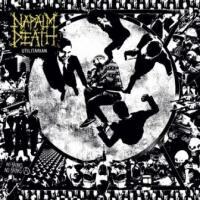 Napalm Death also gets adventurous by injecting a bit of droning doom into "Circumspect" and "Leper Colony". And although the band has always explored experimental pastures, on "Fall on Their Swords", with its mid-tempo, mercurial atmospherics and chanted vocals, it journeys into some truly unorthodox fields. It's about as far out as the group has ever wandered, but it remains, in all its technical adeptness and brutality, uniquely Napalm Death. Utilitarian sounds colossal. It reverberates with palpable ire, and its broadsides of fiery rage have been captured crisply by producer Russ Russel. Finding the perfect equilibrium between savagery and scholarship, the group's political ideals, as intrinsic to its renown as its swiftness, are delivered with masses of punk rock irascibility. The band's demands for action have not been blunted by the passage of time – nor has its belief that society can and ought to do better. And while Napalm Death has more than earned the right to rest up awhile, album number 14 is just as impassioned and forthright as ever. The group has released many classic albums over its long career, and Utilitarian is easily on par with its very strongest work.